A different coming-of-age drama directed by Jean-Paul Civeyrac and inspired by Heinrich von Kleist’s poems. Jean-Paul Civeyrac is a special case of French cinema of recent years. On an international level, he is one of the least known directors of his generation, but even in France, he is only recognized by true cinephiles. He doesn’t belong to any kind of cinema’s new waves or group of filmmakers and he follows a lonely path. His work is characterized by the heavy use of symbolism, the dreamlike scenes and the strong references to theater and poetry. His films have participated in international film festivals and he’s been awarded with the Jean Vigo prize in 2003. 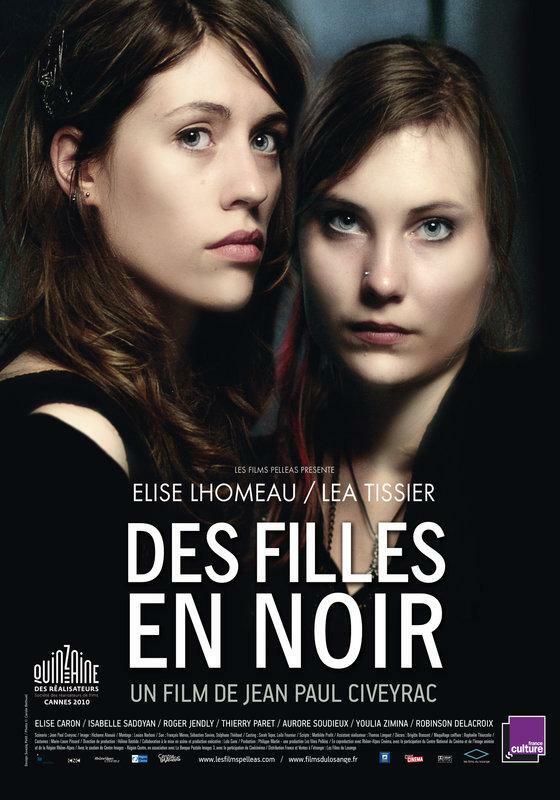 Des Filles en Noir (Young Girls in Black, 2010) is his first feature film after 5 years. The film was selected for the Directors’ Fortnight at Cannes in 2010. Noémie (Elise Lhomeau) is 17 years old, dressed in black, plays the flute and has attempted suicide. Her only friend is her classmate, Priscilla (Léa Tissier). Priscilla is also dressed like her and she is the only one who can understand her. On the occasion of a school project, the two girls read poems by the German romantic writer Heinrich von Kleist who, along with his partner, committed suicide in 1811. Their classmates verbally attack them, making sarcastic and mocking comments, leading them to announce that they will follow Kleist’s example that same night. Jean-Paul Civeyrac’s films generally deal with more provocative topics and this is his first teenage drama. He’s probably not the most suitable director to depict the Goth aesthetics of these girls, since he is not familiar with this kind of theme. He prefers to focus on the dramatic elements of the story, and he is showing them with no exaggerations, which usually characterize similar movies. The screenplay, which has been written by Civeyrac, pays attention to the things that bond his heroines’ lives. Their common ground is their uncertainty about the future, their hopelessness about the present and the feeling of emotional rejection. They are trying to survive in a very cynical society, inspired by the romanticism of the 18th century. Black clothing can theoretically be a manifestation of Goth fashion, but both of them do not hold on the typical appearance and feel that they are living in a truly depressed black environment. They want to give and receive love, but they realize that they have no one to share these feelings with. They realize that the one only has the other and they develop an underlying love affair on the verge of homosexuality. Their relationship is infused with the innocence of a romance they would prefer to live in. Besides, the suicide they’re planning resembles more the one of a beloved couple than of two disillusioned teenagers. In Des Filles en Noir, Civeyrac shifts, up to some extent, his directorial approach. His previous feature film, À Travers la Forêt (Through the Forest), was a typical example of his technique; it is an imaginary and dreamlike journey into poetry, with obvious influences by, verging on being an homage to, Jean Cocteau. Here, he’s following, almost vigorously, the rules of realism and of the drawing room drama. Even though teenage dramas usually have a specific structure, Civeyrac offers a more creative touch to this worn out genre. On the one hand, he offers more of an artistic mood, using Kleist, the flute, Brahms, reminiscent of a French drama. On the other hand, judging by the subject, this could be a less harsh version of a Gus Van Sant film. Despite the adjustments to his direction, his characteristic horizontal long takes and the dreamlike scenes that fall into reality are very much present. I just love this film. Awesome! Thanks for the visit! I also enjoy almost everything that I’ve seen by Civeyrac.